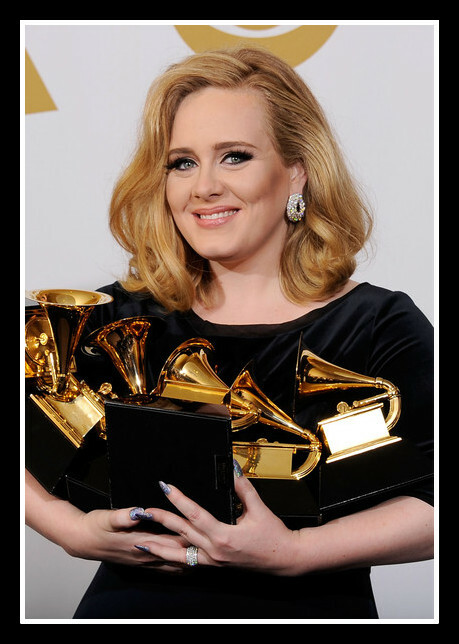 He could have had it all – the boy in the “rubbish relationship” Adele wrote about. Instead, she has it all: the talent, the Grammys, the looks, the attention of the free world and a genuine personality, to boot. Did I mention, she’s only 23? Those eyelashes seemed to be the only faux thing about her. 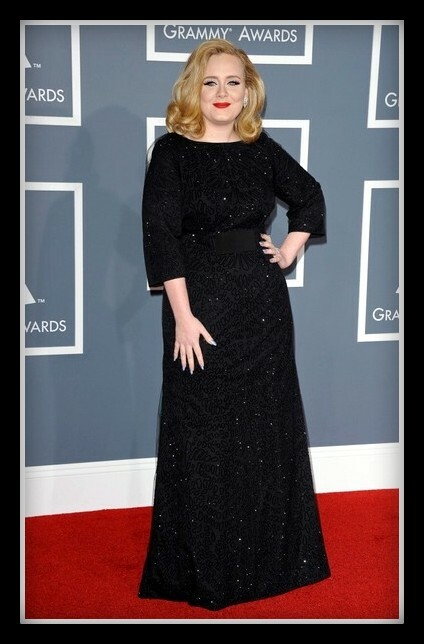 Loved her glammed-up, vamped-up look in Armani Privé, last night. And she's not naked - imagine that! A true reality star! Isn't it nice to actually see authenticity when so many others are talking about it? The whole lot seems to be a bunch of cool cats. 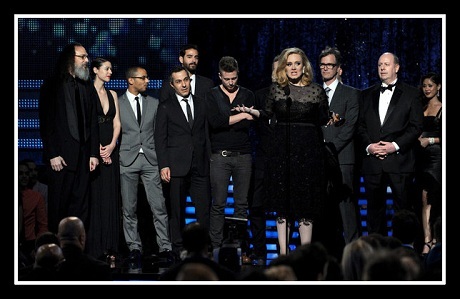 Adele, et al, accepting the Album of the Year award, still wearing her performance dress, her second of the night. "Turn my sorrow into treasured gold." Indeed. The bespoke, midnight-blue Burberry gown she wore in the press room showed off her inner sparkle and complemented the shimmer of her nails. She was my best-dressed of the night. 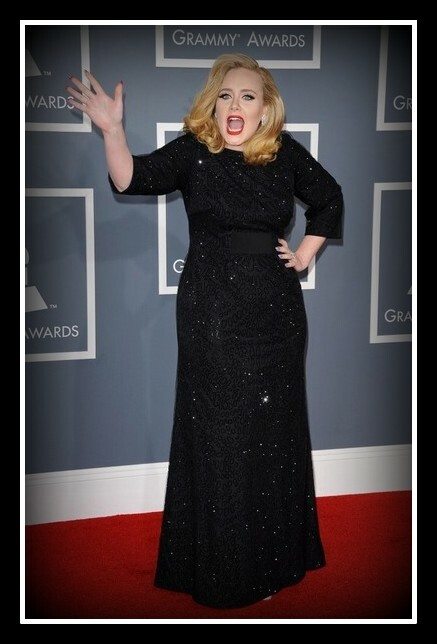 I’ll have more from the Grammys in the coming days. 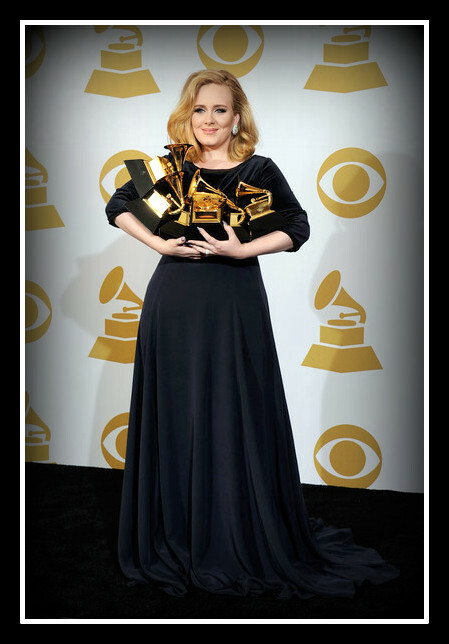 Red carpet photos by Jason Merritt/Getty Images North America; Adele with awards photos by Kevork Djansezian/Getty Images North America; stage photo by Kevin Winter/Getty Images North America.